Pioneers in the industry, we offer automatic paper baling press and horizontal paper baling press from India. With the aid of diligent experts, we are able to bring forth pristine range of Horizontal Automatic Paper Baling Press. The offered baling press is manufactured under the supervision of skilled professionals using the finest quality components and modern technology as per the set industry norms. Before final dispatch, our quality examiners check this baling press on varied parameters of quality to maintain its quality. This baling press is used iron scrap, coir, paper, leather and rubber industries. 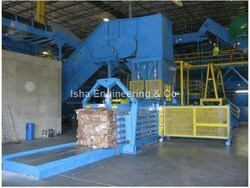 With an increased proportion of technology, we are offering a qualitative assortment of Horizontal Paper Baling Press. Used for cotton, yarn, fabric, iron scrap, coir and paper industries, this baling press is manufactured using quality tested component and sophisticated technology by our adept professionals. Furthermore, this baling press is tested by our quality examiners on varied parameters so as to ensure its flawlessness. 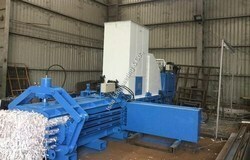 Clients can avail this baling press from us at budget friendly prices. Looking for FULLY AUTOMATIC BALING PRESS ?